In Ep. 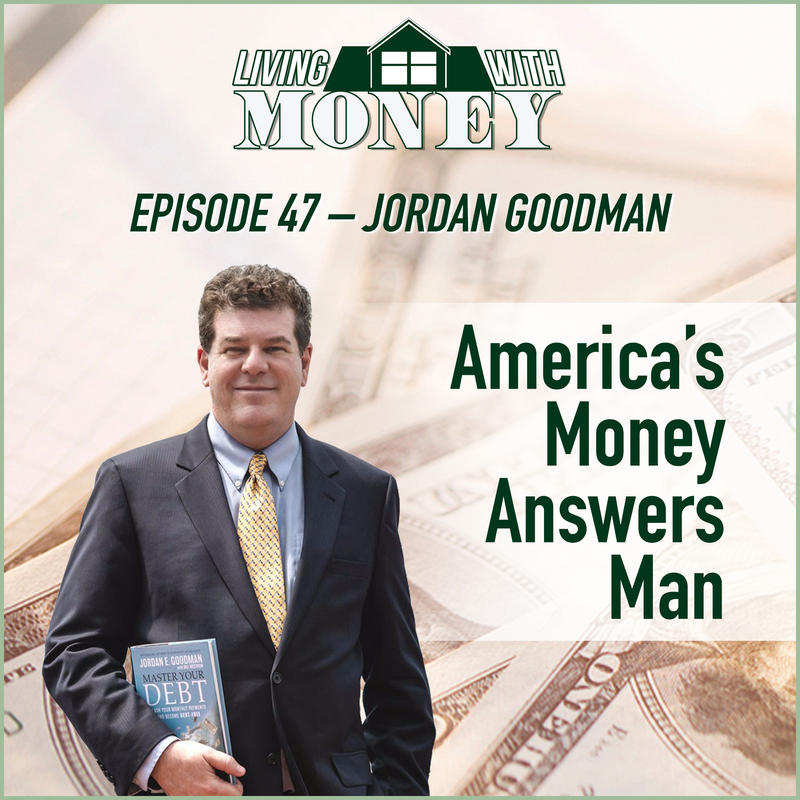 047, Tim talks with America’s Money Answers Man – Jordan Goodman. Jordan has had a long, successful career as a financial journalist, he has had his own national radio show since 2007, authored 14 books, and offers Living With Money listeners hands on, actionable advice to save them thousands of dollars. They discuss mortgage equity optimization, the Heroes Come First Program, verifying your mortgage payments, refinancing car loans and student loans, improving your credit score, & much more! Tim Mullooly: Welcome back to Living With Money. This is Tim Mullooly. On today’s episode I am joined by Jordan Goodman. Jordan is known as America’s Money Answers Man. He’s had a long, long career, featured on different TV shows, radio stations, the author of 14 books spanning over a number of decades that we’re going to touch on a couple here today during the show. With that, Jordan, thank you for coming on the podcast. Jordan Goodman: Great to be with you, Tim. Tim Mullooly: First, can you provide the listeners with just a brief background about yourself, how your career got started and how you got to where you are today. Jordan Goodman: I have been America’s Money Answers Man for a long time. I went to Columbia School of Journalism, always been a financial journalist. I was at Money magazine for 18 years. As you said, I’ve done 14 books. I did the, “Dictionary of Finance and Investment Terms,” “Master Your Debt.” I’ve done one called, “Fast Profits in Hard Times.” I won’t go through all 14, but lots of different books on different topics. I am a regular guest on radio shows, on TV shows. I’ve got my own show called, “The Money Answers Show.” Moneyanswers.com is my website. I’ve been helping people with all kinds of ways to improve their personal finances for many, many years. As we go through this today, I warn people up front, I’m going to talk about different strategies and give people specific websites and phone numbers so they can take action. I’m all about action, Tim, not just general ideas. Here’s specific things that can really improve your financial lives. There’ll be lots of specific resources during this podcast. Tim Mullooly: Right, and I feel like that’s what it’s all about, taking action. So many podcasts, books, things like that just give you details, but don’t really give you the hands on places to go find them and take action on them. Right? Jordan Goodman: You will get those today, I guarantee you. Tim Mullooly: Awesome. For the listeners out there, Jordan has created a personal landing page for anyone listening to this podcast, you can find free reports and anything, the information that we talk about during the show. You can go to go.moneyanswers.com/livingwithmoney and that link will be in the show notes as well. Jordan, having a career that has spanned a number of decades, can you talk about how, if at all, people’s struggles with personal finance have changed over the years? Are they the same as they’ve always been? Jordan Goodman: I think they are bigger today. Everything is bigger. Price of homes is much higher. People have to take on bigger mortgages. The amount of student debt is much, much bigger than it ever was in the past. The interest rates on credit cards are much higher than they were in the past. The stock market is much higher than it was in the past. The stakes are bigger. The mistakes people make are bigger. If you do it right, you can do a lot better. I mean, the people who’ve done really well with this bull market have done extremely well. A lot of people have been left out of that. I guess you’d say the stakes are much bigger than they were 20 or 30 years ago. Tim Mullooly: Right. Like you’re saying, the stakes are much higher, but just those underlying like people back in the ’80s still had problems with paying off their mortgage or paying off debt and credit cards. The underlying problems are still the same just at a higher degree. Jordan Goodman: Yeah, back in the ’80s we had much higher interest rates on mortgages. You had 14% mortgages. Today we have 4%, 5% mortgages. The interest rates are down but the house prices are much higher today than they were then. You may have a smaller interest rate on a much bigger home price. I think lately that’s been slowing the housing market because people are being much more cautious about taking on a home. One change that’s been major this year, which I think is really hitting the housing market particularly in high tax states, is this limitation on state and local income taxes and the property taxes at $10,000. If you’re in New Jersey or New York or California or the high tax states, that really means the after tax cost of housing has gone up dramatically. I mean, if you had 30 or $40,000 in property taxes and income taxes deductible, it was a lot, but at least you could get a deduction for it. Today that’s limited to 10,000. That’s made a major difference in people’s willingness and ability to buy homes. That’s the kind of change that we’ve seen over the years. Tax law really does affect behavior. Tim Mullooly: Definitely. Talking about mortgages, that’s usually the biggest debt that a person has to pay or owes over their lifetime. Are there any ways for people to pay off a traditional 30 year mortgage faster than the 30 years that the mortgage is for? Jordan Goodman: Absolutely. This is something you’ll never hear about from banks. Okay. There’s a strategy called mortgage equity optimization that literally will allow the average person to pay off a 30 year mortgage in roughly five to seven years depending on how the number work on your existing level of income. Okay. It’s quite an amazing thing that you never probably heard about from traditional. Tim Mullooly: I was going to say that makes sense that the banks don’t want you paying that off that quickly. Jordan Goodman: They do not. Tim Mullooly: They want the money stretched over the 30 years. Jordan Goodman: They are real happy by getting all that interest and even better if you refinance your mortgage and start a new 30 year clock all over again. They like that even better because when you have a 30 year mortgage, here’s the traditional system, Tim. You keep your money, your paycheck, your income sitting in the checking account earning nothing. Then you have a 30 year mortgage where all the interest is upfront. The first 10 to 15 years you’re paying almost all interests. After maybe 15 years in a mortgage, you may pay off 10% of the principal, something like that. They get all the interest upfront. Again, if they refinance, you start more than just upfront as well. The system as it is now works really, really well for the banks. Now this mortgage optimization completely reverses the tables and your money is actually working for you instead of the bank. I’m just going to very simple explain how this thing works. Get a home equity line of credit or HELOC as they call it, which is a liquid line against your house and you can put money in, you can take it out whenever you like. You use that almost like your checking account and then you blend the HELOC with the first mortgage and you end up paying your first mortgage off faster. Say you had a $50,000 HELOC and you just got $1,000 paycheck. Instead of keeping your checking account, you put it in the HELOC and now instead of owing $50,000, you owe $49,000 so you’re paying interest on a lower principal amount and then you keep having income going in there. Every day you’ll make a little bit of progress in your principal and then you pay your bills out of the HELOC as well. Your money is working for you every day instead of working for the bank. If it might help. Let me just do a very simple example, Tim, of how this would work because it’s a new concept to a lot of people. All right. Jordan Goodman: Say you had a house worth 300,000 and say you had a $200,000 first mortgage at a good rate, 4% something like that. You went out and got a HELOC for 50,000. You just opened it so it hasn’t been used yet. You would then write a check on that HELOC, 50,000 towards the first. Instead of owing 200, you now owe 150 on the first and 50 on the HELOC. During the next year or so, you keep your income going in that HELOC pushing the principal down every day and say after a year or so you pay that $50,000 HELOC down to zero. You then do it again. You write another check on the HELOC, 50,000 towards the first. Instead of 150, now 100. Over the next year, you pay the HELOC off, you do that twice more. After roughly four years you paid off the first and then you pay off the HELOC over the next year. There you go in five years, you have completely become mortgage free without having any extra income, but just the way you’re flowing your money makes a difference. Now there’s a free website that can actually help you model this in your own specific situation, which is truthinequity.com. At that site, you fill out what’s called a personal profile, which gives you all the numbers. What’s your income, what’s your expenses, your house value, your mortgage, all those things are going to say, okay, based on what you’re doing today, it’s going to take you 28 years to pay off your mortgage whatever it may be. Based on the numbers you just gave us it’ll be 5.6 years, whatever it comes out to be. Then they show you step by step how to actually implement. I’ve kind of oversimplified the idea, but you see how your money is working for you every day by getting that principal being paid down in the HELOC as opposed to traditional system where you might be sitting in the checking account earning nothing for you. The bank takes your money and lends it back to you at 4% for a mortgage or 15% for credit card. Your money is always working for the bank. A very simple way of putting it, but literally, can you imagine a couple and say 35 and their mortgage is paid off by 40 instead of 65? What a difference that will make in their lives? It’s a transformational system. There are three things you need to make it work, Tim. The first thing, you got to have equity in your house. If you’re underwater in your house, there’s nothing to borrow against. The second thing is you got to have a credit score of maybe 680 or higher to qualify for the HELOC. The third thing, positive cash flow. During the month, more money coming in than going out because that positive cash flow is what’s pushing that principal down. The more positive cash flow you’ve got, the faster it’ll be paid off. I bet the vast majority of your listeners have those three things and literally we’ve just saved them 25 years off their mortgage and tens of thousands of dollars in needless interest. Tim Mullooly: Right. I was going to say as you were lifting out those three different things I was like, most people check one, two, three boxes there. Those aren’t terribly hard things to have, but knowing that the bank wants to stretch the payments out and maximize the interest it makes sense not a lot of people know about what you just outlined. I mean, it’s eye-opening. Definitely, all of these places that we talk about, we’re going to link in the show notes. Jordan Goodman: It’s a very helpful website. Again, the free website truthinequity.com. They’ve got videos, they’ve got all kinds of things and they’ve been doing this for a long, long time and it’s a mental leap that people have to make. I mean, why didn’t my bank tell me about this one? Because the bank doesn’t want you to, something like that. Tim Mullooly: Right. It’s not in their interest to tell you that. Jordan Goodman: Correct. Anyway, there you go. We’ve just paid off their mortgages far, far faster than they ever imagined possible. Tim Mullooly: Awesome. Kind of building off that, do you want to talk a little bit about the Heroes Come First program and how that can help participants with their mortgage savings and their finances? Jordan Goodman: Heroes Come First is a way for American heroes to save a huge amount of money on mortgages and everything that’s going into buying and selling a home. A hero is defined as anybody in active duty military or veteran. Anybody in the medical field, doctors, dentists, nurses, anything in that field, firemen, policemen, EMTs, teachers and clergy. The giving professions, give back. Now it’s nice, you go in the airport and you say thank you for your service to somebody who’s in uniform, but this is actually giving them thousands of dollars, which is much better. The website they can find out about is heroescomefirst.com. They’ve also got a phone number, 888-437-6114. Here’s how it works. When you are buying a home as a hero, you can get a rebate of one quarter of the realtor’s commission which can be thousands of dollars depending on the price of the home. Same when you sell your home, you can get a rebate of a quarter of the real estate commission. You get a lower interest rate on the mortgage. You get all the closing costs, legal fees, escrow, appraisals, title, all those things. They get discounts off of them as well as long as the providers are within that Heroes Come First program. It’s a way of giving back to people. Recently we had these huge fires in California. Everybody’s trying to get out of there, right? Well, the firemen are running right into that stuff. Right? It’s quite amazing courage that they do something like that. This is the way of rewarding people for putting their lives on the line literally all the time with huge savings. On many occasions they have a hard time buying homes. They even have a grant program of up to $10,000 for down payment on a first home, which is a grant you don’t have to repay. Just all kinds of ways that heroes can get better deals when buying a home, when selling a home, when getting a mortgage, when refinancing their mortgage, second homes, all those kind of things. Again, if that helps some of your folks. If you have some heroes in your audience, which I hope you do, heroescomefirst.com 888-437-6114. It’s nice to give back to people who are giving all the time. Tim Mullooly: Yeah, absolutely. I mean they’re all putting their lives on the line whether doctors, like you said, firefighters, first responders. That’s a really great program. Hopefully, people in the audience can take advantage of that. Jordan Goodman: If they’re heroes or they know heroes. Tim Mullooly: Exactly, yeah. Just spread the word about that program because anyone who falls into those categories would love to take advantage of those opportunities. Do you want to talk a little bit about the importance of making sure, verifying that your mortgage loan payments are correct and how that can really help a homeowner in the long run? Jordan Goodman: A lot of people are paying too much on their mortgage and they don’t even know they’re paying too much. If they have an adjusted rate mortgage, there’s all kinds of things that can go wrong with your payment. Interest rates are going up and down and that’s usually based on an index and there’s a spread over the index. 40 to 50% of the cases, people’s mortgage payments are incorrect so there’s actually a service called verifymymortgage.com which can help people audit it and see if it’s correct. They get your original document. They see what you paid. They see what the numbers should be, and in many, many cases find out it’s wrong and then they prepare a letter saying, “You should give him Mr. Jones a rebate of $8,000 and change his payment from $450 a month to $350 a month because you’ve got it all wrong.” In many cases, mortgages are being sold from one servicing company to another. All kinds of reasons. Mistakes are being made all the time. There is a service that can literally save you thousands of dollars and if your payment is correct or if you underpay, you just don’t want to mention anything but the vast majority of time you’re overpaying your mortgage. Again, the website for that, verifymymortgage.com or 800-888-6781. 40 to 50% of the mortgages that they audit, they find it wrong. Tim Mullooly: That’s outstanding. That’s such a large number, and like we were saying before, mortgages are the biggest payments that a lot of people have to make. I personally would want to know that all of that money is correct. You know, that that number is right. Jordan Goodman: By the way, they verify other things related to mortgages, escrow where they’re holding money aside for property taxes and insurance. They’re often over escrowing that as well. The same people do verifymyescrow.com, and also the other one is private mortgage insurance, PMI. In many cases, you’re over the 20% threshold, but the private mortgage insurance company is not going to tell you that. You can go on and on and they do the same thing, verifymypmi.com to see … For example, say the house values in your area have appreciated a lot. You may be over the 20% threshold. Say you did a home improvement that increased the value of your home. Well, the private mortgage insurance company, they want to make those, get those premium payments as long as possible so they’re not going to tell you, “Oh, we just rang the bell and you’re over 20% and stopped the payments.” They don’t do that. You have to find it on your own. The same people do verifymymortgage, verifymyescrow, and verifymypmi and can save people hundreds of thousands of dollars. Tim Mullooly: Well, I’m sure listeners out there can definitely benefit from that. I know me personally, I am going to go to verifymyescrow.com because I act as you were saying that, my mortgage was sold to another service company just last month. I had an issue with the escrow payments. They mistakenly thought that I needed to have a couple thousand dollars more in my escrow account and I didn’t. Jordan Goodman: Happens all the time. Tim Mullooly: That’s one person already that’s going to benefit. Jordan Goodman: They’re estimating too much for the insurance premiums and the property taxes. Tim Mullooly: Mortgages aren’t the only type of large loans that people have. Car loans are increasingly getting bigger and bigger for people. Can you talk about the process of potentially refinancing your car loan and why that might be a good idea for some people? Jordan Goodman: Okay, that’s dangerous but that’s what they do. Then through the GPS, they know exactly where your car is. They send the repo man to pick up your car and there you are. It’s much easier to pick up your car today than the old days where you’re chasing the guy around, the repo guy comes. You bring out your shotgun. You don’t need to do that stuff anymore. As a result of that, many, many more people have been getting car loans than in the past would not have gotten them at some pretty high interest rates. What they don’t realize is you can refinance your car loan either by getting a lower interest rate or by changing the maturity to bring the payment down to a more affordable level. There’s a free website that will help you do that which is myloangen.com, myloangen.com. Myloan G-E-N.com and at that site you put in your payment, how many more months you have to go, the interest rate, how much you owe on the loan, and then it’s going to give you like a little dial that you can choose. Maybe you want to extend the maturity to get the payment down or you can pick a lower interest rate to get the payment down. You choose the payment that you want, that fits your budget better, and then you hit submit. It goes through a bunch of credit unions around the country who compete for your business to get you the best deal on your car loan. Say today you’re at $500 a month with three years to go and you’re finding that hard to pay. If you move it out to say six years instead of three years, it might bring it down to say 250 and you might pay more interest in the long run, but it’s a more affordable payment for you and you’re going to hold onto the car anyway. It’s up to you as to what level maturity and interest rate you choose, but there you go. We just refinanced your car loan to make it more affordable so you cannot have to be dealing with the repo man. Tim Mullooly: Right, exactly. It goes back to what we were saying about with the mortgage too like just making sure that your dollars are working best for you. If that lower number per month it helps your cash flow and you can put that extra money towards something better, if you’re going to hold onto the car anyway, that might be a good idea to do. Right? Jordan Goodman: Not probably. Obviously, if you have decent credit to get the lowest interest rates, but in general, you can get a lower interest rate than you have now and certainly pick the maturity that works best for you based on your budget. Tim Mullooly: Right, and you just mentioned decent credit. This mortgage and car loans that we’ve been talking about, people won’t be able to get those loans without good credit. Can you talk a little bit about the importance of having good credit and how you can check to see what your credit is and ways to possibly improve that credit score? Jordan Goodman: It is so important today. Credit is more important not only relating to loans, but for example, when you apply for a job, they’re going to look at your credit score. Jordan Goodman: You may not get a job because your credit score isn’t good. When you want to rent an apartment, they’re going to take a look at your credit score and if you have a bad credit score, you might not be able to rent an apartment. When you apply for car insurance, they may look at your credit score. If you have a bad credit score, they either may not give it to you at all or have a higher rate because they base their car insurance premiums more on your credit score than your driving record, as crazy as it may sound. There’s all kinds of other ways that credit score has impact your life beyond traditional credit decisions. You really do need to stay on top of it. A website to watch your credit score all the time is guardmycredit.com. If you want to improve your credit score, you’ve got to get errors off of there and many, many credit scores have tremendous errors. In many cases, not that you did anything wrong, but the credit bureaus confused your name with somebody else’s, may have a similar name or similar address or something like that. I always say that they always confuse you with some deadbeat. You’re not going to be confused with Bill Gates or Warren Buffett. Unfortunately, that doesn’t work usually very often. Jordan Goodman: There’s something called the FACTFA law, the Fair and Accurate Credit Transactions Act, which says you have the right to challenge errors on your credit report and if the creditor can’t prove it’s accurate within 30 days, it has to come off. Now that’s the theory. The reality is you’ve got to chase them around. It’s a whole process to improve your credit in various ways, but really it pays off if you can. There’s a website that can help you do that, which is called tourdecredit.com, T-O-U-R-D-E credit.com. It’s a place called better qualified and they will help you get errors off your credit report. The average credit score goes up between 50 and 100 points when you get all these errors off of there. Again, it’s often not something you did wrong. The credit bureaus did it wrong. You could have been hacked and there’s been all kinds of places it would have been hacked and people stealing your ID and messing things up with your credit. It’s just something you spend some time. Most people are not going to spend the time and effort cleaning up their credit and getting errors off, and that’s why something like this tourdecredit.com can probably help you. Tim Mullooly: Definitely. I mean 50 to 100 points could really make a difference. Getting a rate on a loan, whether it’s for a car, for a mortgage, something like that. Jordan Goodman: All the other ways having a better credit. “Oh, I’m not going to be applying for a loan.” Well, there’s other ways that the credit is going to affect you, so you want your credit score to be as high as possible at all times. Tim Mullooly: When it comes to life insurance policies, do you want to talk a little bit about the possibilities that individuals have when those policies lapse or what they might be able to do when that happens? Jordan Goodman: A lot of people don’t realize that if either they can’t afford a life insurance policy or they don’t need it anymore, most people just let the policy lapse. The insurance company is real happy about that. They’ve been getting premiums from you for many years and never have to make a payment to you, but you can sell those life insurance policy in what’s called the life settlement market and literally earn tens, if not, hundreds of thousands of dollars. Because the people taking over the policy pay the premiums and then they get the death benefit when you die ultimately. Say you have a million dollar policy and you’re 70 years old, something like that. You don’t really need the policy anymore because your kids are self-sufficient, that kind of thing. Well, you might be able to sell that policy for $300,000 or something like that because the people buying it, which tend to be hedge funds and large institutions, when you die, they’ve paid 300,000 for it, they get the million. They’re going to triple their money. Now they don’t know when that’s going to be, the older you are and frankly the sicker you are, the more money you’re going to get for that life insurance policy because the people buying it would rather that you not stick around too long. The result for you say you’re 70 and you have $300,000 you could use to invest for retirement, what a difference that’s going to make in your life instead of having it lapsed. Again, the life insurance company will never tell you that’s an option. They’d love to have it lapsed because they didn’t have to make any payouts and they got the premiums for you for many, many years. There’s an independent site that can help you do that, which is called fundinglife.com. They’ve also got a phone number, 877-485-6681. Basically, they put buyers and sellers of life insurance policies together. Your listeners would be the sellers of life insurance policies, and then they’re going to look at the situation, see what your age is, what the cash value is, if it makes sense. If it does make sense, they have more buyers looking to buy life insurance policies than they have people selling. There’s actually would be a competition amongst buyers to get you the best possible deal in what’s called the life settlement market. There you go. I’ve just given your listeners hundreds of thousands of dollars from a policy that normally would lapse, they would get nothing from. Again, the insurance company is never going to tell you about that as a possibility. Tim Mullooly: Right, yeah. They definitely don’t want you to know about a site like this. Again, this site is fundinglife.com. Every site and phone number that we talked about here again, for the listeners, we’re going to link to in the show notes so you can definitely and should check out all of these things that we’re talking about here. Jordan, I am 26 years old. I’m a millennial, so for my generation people my age, student loans are a huge deal. Is there any way that students or former students might be able to refinance their loans and potentially make the payments easier for them? Jordan Goodman: Absolutely. Now the first thing you can do is consolidate. If you have a bunch of federal loans, you can consolidate them into one, but the bigger way to save money is to refinance them and you might have federal loans, but you probably have some private loans as well. You couldn’t get enough money only with federal loans to make it through college, so you might have some private loans and federal loans at interest rates of five, six, seven, 10% in a much, much higher rates. There’s a whole new field now of companies that refinance student loans through interest rates. Typically in the two to 3% area. My favorite place is called credible and their website is credible.com. Then just do forward slash money answers. They know it’s me. That way you get 200 bucks off your first payment actually. Jordan Goodman: They also have a phone number as well, 855-870-6005. Yes, what they do. Credible doesn’t lend itself. Credible is a platform which has about 10 different companies, credit unions and there are some companies that just specialize in refinancing student loans. You pick what’s best for you. There’s some fixed loan, fixed rate interest rate options. There’s some variable rate options. There’s a bunch of different possibilities. You pick what’s best for you and you apply for it right there. Now you’ll have one payment to make at a lower interest rate and hopefully pay these things off faster. It is a huge burden on this generation. The average person is graduating with about 39,000 in student loan debt. The total is about 1.5 trillion and 20 to 25% of them are either in default or delinquency these days. That’s going to be going up a lot. If you’ve got a lot of student loan debt, you don’t want to be paying on that for 30 years. This is a way to hopefully pay it off quicker. Again, the website I gave is credible.com/moneyanswers or 855-870-6005. Tim Mullooly: All of these topics that we’ve been talking about today, I think it’s all just things that these institutions aren’t going to tell you about because it’s in their best interests to not do that. For everyone listening out there, I definitely recommend checking out all of these websites. It’s just ways to make payments easier or quicker and just save you money in the long run. That was more for students who have these loans. Your book in 2015 is called, “The Ultimate Guide to Student Loans,” talks all about student loans. Can you talk about how that book talks to the parents of students who are taking on these loans and how it might be a good idea for them to think about investing before their students take on these loans? Jordan Goodman: The name of the book, “The Ultimate Guide to Student Loans.” I talk about investing before so that they don’t have to borrow as much. Getting the best deals when you got to college and then paying them off afterwards. The first 18 years before they go to school is the time to be investing. Probably the section 529 plans are the best ones. In many cases, your state plan allows you to get a state tax deduction for up to maybe $5,000 or so. As long as the money stays in there, it grows tax free, as long as it’s used for college education, room and board, tuition, things like that. I like to say every dollar you can save or invest upfront is when you don’t have to borrow when you get to college. Because people are getting there and that you shouldn’t expect to be able to fund the entire college bill, which is so staggering these days. I think there’s 150 colleges now over $60,000 a year in tuition. It’s just staggering. Those are the private schools. Now, some of them will give financial aid, but you can’t count on them, particularly if you’re doing well. They’ll bring you through what’s called the FAFSA form, Which is basically what is your need. Tim Mullooly: Right, and that’s the wrong mindset to have. Like you were saying, every little bit helps. Any dollar that you can invest now and get ready for is some that you’re not going to have to borrow and eventually pay interest to pay back the loan over time. That was for the listeners, that was from Jordan’s book, “The Ultimate Guide to Student Loans.” It came out in 2015. We’ll link to that in the show notes as well. Jordan, do you want to talk a little bit about your weekly national Money Answers radio show and what listeners can gain from tuning into that? Jordan Goodman: It’s called The Money Answers Show. It’s on the VoiceAmerica Business Network. I have a link to it at my website at moneyanswers.com. I’ve been doing it since 2007 every week and interview really the top people in personal finance on all kinds. If they’re in budgeting, on real estate, on investing. This last week I did a guy having to do with artificial intelligence. Just many, many different topics. Then they can listen to it whenever they like. It live. It’s on Mondays from three to four, but you know, listen to it whenever you like and go to moneyanswers.com and there it is. I enjoy interviewing all the top people in all aspects of personal finance. Tim Mullooly: That’s great. Listeners out there, if you’ve enjoyed this episode so far, you can get much more of that from Jordan by tuning into his show as well. A couple more questions here before we wrap up. We’re in the swing of things in terms of the holiday season right now, Jordan. Do you have any personal finance tidbits that we haven’t really touched on here today that might be helpful for people during the holiday season? Jordan Goodman: People go into a huge amount of credit card debt because a lot of the purchase that they’re making are online. We just had the biggest cyber Monday in history, roughly eight billion dollars’ worth of goods were sold on one day. All of it on credit cards. Tim Mullooly: I was going to say, it’d be interesting to see how much of that is on credit cards that, you know, people can’t pay back. Jordan Goodman: The vast majority of it. Going into the season, they did a recent survey. They found that 40% of the people, so they’re going to buy holiday gifts knowing in advance they don’t have the money to pay it when the bills come in in January and they’re going to do it anyway. That’s what makes America great. Tim Mullooly: That’s the reality of it. Jordan Goodman: I’m getting such a great deal, that kind of thing. The fact that I can’t afford it never even come to their mind. Get better credit cards is what it comes down to. A lot of people are paying 18% or 25% or some ridiculous high rate. There are much better deals to be had. You just have to go get them instead of waiting for them to show up to you. There’s a free website guidetocreditcard.com where you can find the best deals, lowest interest rates, nine, 10%, something like that. You can get frequent flyer miles if you want to take trips. You can do cash rebates, maybe 5% back. There’s all kinds of rewards cards. There’s 0% balance transfer. There’s lots of great deals, but you got to spend a little time going forward. What I like to say is concentrate your spending on two or three cards that give you the rewards that are best for your situation. What people do is they have like 10 different cards. They spread, they’re spending them out all the different cards, and by the time they have enough frequent flyer miles for a trip, they expire or something like that. Concentrate your spending where you’re going to get the best possible deal for your specific needs. There’s an objective website guidetocreditcard.com that can find all the best deals and then you apply for them right there and credit is relatively easy to get, particularly if your credit score is good. Save yourself a bunch of money on interest or get benefits one way or the other, like you can get rebates and 5% back on your money. That can really add up. Tim Mullooly: Yeah, definitely. We know that people are going to use credit cards for all of these holiday purchases, so more just picking the right credit cards to use as opposed to trying to get people to eliminate credit cards altogether. Tim Mullooly: To kind of wrap up, if you had to sum up the underlying principles of responsible personal finance to a person, what would one or two of those principles be? Jordan Goodman: Pay attention to your finances. A lot of people don’t. One of the books I did is called, “Master Your Money Type.” I talk about people’s different financial personalities. One of those personalities is the ostrich, it’s like, I don’t care about my money stuff, I don’t open statements, I don’t look at my bank account, I don’t balance my checkbook, I don’t look at my investments. It’ll all just take care of itself somehow. It doesn’t. Okay. You got to pay attention. In general, the more you pay attention, the better you’re going to do, in all the things we’ve talked about. The idea is to get into good financial habits, so automatically the right things are happening instead of for a lot of people, automatically the wrong things are happening. On credit cards, instead of making the minimum payment on your credit card and paying 18% interest, pay it off every month and get a 5% cash rebate. Just look at the things we’ve talked about, Tim, during this time together. We’ve paid off their mortgage in 25 years faster than they ever thought possible. We’ve given tremendous deals for heroes, save on buying and selling homes. If they have taken mistakes on their mortgage, we verify their mortgage, we’re improving their credit in various ways. We’ve given them thousands, maybe tens of thousands of dollars in selling life insurance policy that otherwise would go and lapse. We help them refinance their student loans. We got them better credit cards. These are all things that they can do and make a huge difference in their financial lives and I’ve given you all the resources for them, so just pay attention. Implement some of these things and it has a huge, huge payoff. Tim Mullooly: All of these things that we’re talking about, it just takes a little bit of work to go and find all of this information. Like you’re saying, just pay attention and know that these tips and things are out there for you to take advantage of. Jordan Goodman: I’ve done the work for you. Okay. I’ve done this before. Tim Mullooly: Exactly. We’ve made it easy for people. Jordan Goodman: You wouldn’t find these things on your own typically, but that’s why it’s good to listen to your podcast because you get all kinds of great ideas. Tim Mullooly: Absolutely. One last question for you. I like to ask all the guests as we wrap up, what’s one piece of advice, whether it’s personal or professional or both that you have received over your lifetime that has always stuck with. Jordan Goodman: The power of leveraging relationships. Now, by leveraging, I don’t mean debt. I mean, you bring something to a relationship, another person brings it, and one plus one equals three. Okay? You can do things the two of you combined that either of you can’t do independently. That’s true both personally and professionally. I mean, professionally, say you’re an entrepreneur. A lot of entrepreneurs want to do everything themselves because they don’t trust anybody else to do it. You can only do so much yourself. You only have so much time, so much effort. Hopefully you sleep a little bit every day, but if you leverage other people’s, what they bring to the party. They may bring other contacts. They may bring financing. They may bring marketing. They may bring new product ideas. Then you bring what you bring to it. The two of you combined can make amazing things happen. That’s the key to success in both your personal life and business life is leveraging relationships and amazing kinds of things can happen. Particularly today with the internet, it doesn’t have to be somebody you are seeing in person. You can leverage relationships literally anywhere in the world by combining your expertise with that of other people and make a huge, huge difference and help yourself financially all kinds of ways. Tim Mullooly: Yeah, I definitely agree with that. Jordan, that was all the questions that I had for you today. Thank you for coming on the show and providing all the listeners with such great information. Jordan Goodman: Great. Again, go to that landing page where they can see more, go.moneyanswers.com/livingwithmoney and get my free website and newsletter and blogs. There’s all kinds of links. We’ve just got a small sample of what I’ve got at moneyanswers.com to help people improve their financial lives. I’m also glad to take emails from your listeners as well. Tim Mullooly: Awesome. That’s great. Listeners out there, everything that we’ve talked about here today, we’ve listed a number of different websites and phone numbers. All of that will be in the show notes, so thanks for tuning in to this episode of Living With Money and we will see you on the next one.